Located on Fairfax Avenue in Mid-City Los Angeles, is a gastropub called The Golden State. It’s a small joint known for their burgers and ecclectic milkshakes and floats. Burgers are “IN” now- all over LA there are new burger joints popping up, each place competiting for the title of “Best Burger in LA”. The Golden State was recommended to me by someone who reads my blog- she noticed I blog about a lot of burgers, and told me that I must try this place. She said it was better than Father’s Office! That got my attention so I definitely had to make my way to The Golden State to try one of their burgers ASAP. The menu mainly offers burgers and fries, salads and sandwiches, but they are also known for their drinks- most famously, their beer floats. The Golden State makes their own gelato and all the flavors are super unique. A couple of flavors are chocolate rasberry, peach champagne, spicy chocolate, salted caramel, lavender goat cheese, brown bread, lychee yuzu, almond, caramel oreo, and pistacio Triple Sec. They feature new ones all the time. The gelato is homemade and you can choose any flavor as a scoop for your beer float. They offer an exclusive selection of wine and beer on draft and bottled too. If you don’t drink beer, you can get a float with Root Beer, Coke, or even Ginger Ale! I went with my co-workers for lunch during a work day, so didn’t get a beer float which I will definitely be going back for, but we all did try “The Burger”, which is their famous burger. Made with Harris Ranch Beef, Fiscalini Farms cheddar, glazed applewood smoked bacon, arugula, aioli, & ketchup, the burger was delicious. Everyone really enjoyed their burgers. Unlike Father’s Office, you are allowed to make substitutions at The Golden State, and there IS ketchup. 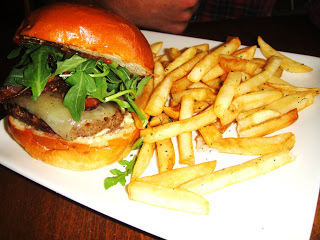 (No Ketchup at Father’s Office- read my post about it). Do I think it was better than Father’s Office? No, I like Father’s Office better. But, I did really like “The Burger” at Golden State and would go back again. The meat was cooked perfectly, and just the way I asked- medium-rare. The bacon, cheese, arugula, aoili and ketchup is always a good combination, and the bread was a warm brioche bun which was also good. I ordered Jalepeno Cabbage Slaw as my side with my burger and it was amazing. Loved it. Great flavor, and different tasting. Highly recommended! Overall, The Golden State was great. I’d go back again. Everything was good. I definitely will try one of their unique gelato flavors and a beer float next time. If you love burgers like me, this place is worth a try!